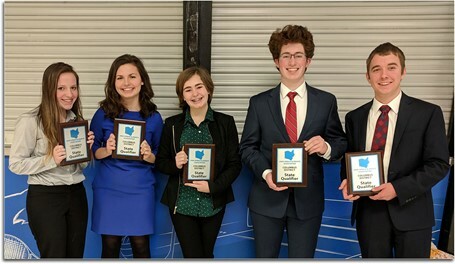 On February 2, MVHS Speech and Debate team competed against 12 of the Columbus area's best teams and qualified for the Ohio Speech and Debate Association's 2019 State Finals. Kylie Goudy, Clare Mazzei, Makenna Hughes, Zach Broeren, and Charlie Mayville present their award plaques from the Columbus District Speech and Debate tournament. Along with Curtis Erlandson, who earned enough regular-season bids to bypass the district tournament, these students will be competing in the Ohio High School Speech League State Finals in early March at Jackson High School in North Canton. Way to go Jacket Debaters!